Why should I use a Personal Cooling Products Cool Vest ? Heat stress is the enemy of industrial safety. We provide a simple, effective answer to heat stress management. This is simply the best cooling vest on the market. Cool Vests...Why should I use a Personal Cooling Products Cool Vest ? Heat stress causes slowed reaction time, reduced energy, difficulty with coordination and attention, weakness of muscles, reduced strength during heavy physical exertion and loss of comfort doing normal day to day activities. In a work environment, this may result in reduced safety, risk of injury, decreased efficiency and overall loss of productivity. Personal Cooling Product’s Cool Vests are designed to keep your body's core temperature within safe levels during physical exertion within high-heat environments. They are comfortable to wear without any restriction of movement. The Personal Cooling Products Cool Vest uses hexagonal cooling pouches containing patented Exotherm® Endurance technology which solidifies at a higher temperature than water. This means it takes longer to melt, exchanges heat at a more comfortable temperature, and can be recharged quickly. Simply place your vest over your head and adjust the straps to fit comfortably. You will immediately feel the cooling effect. When the Exotherm® melts, it changes colour from white to clear. Your vest will work to cool you so long as there is some white Exotherm® in the hexagonal pouches. When you have finished with your cooling vest, or the hexagonal pouches are all clear, remove your cooling vest and recharge it. Recharging is simple. You can place it flat into a fridge for about 20 minutes, leave it in an air-conditioned environment for about 40 minutes or submerge it into a large tub/esky of ice and water for about 15 minutes. The size of the contact area is a limiting factor in how effectively any cooling product can draw heat out of the body. Personal Cooling Products Cool Vests cover the torso - front and back – for maximum heat extraction. The amount of cooling time each individual will experience using the Cool Vest will be a variable of ambient temperatures, workload and personal physiology. It is for this reason we do not specify a certain time frame, but you will be more than pleased. We recommend you read the testimonials we have received and the test data we can send to you to gauge expected time frames. Why Not Just Ice ? For years, people have relied on ice for everything from treating injuries to cooling off from the summer's heat. While it is both cold and readily available, ice has a major problem - it's too cold. It’s like using a blow-torch to dry your hair - it might work, but if it is used too long it will burn, because its temperature is just too extreme for the job at hand. In fact, US Military testing has shown that over-cooling the skin can cause the body to close off its capillaries, blocking the body's natural ability to expel heat and compounding heat stress. Because it self-regulates to the optimal temperature for body cooling, the Personal Cooling Products Cool Vest creates a comfortable microclimate around the body. Personal Cooling Products Cool Vests were designed initially for keeping construction workers, mine site workers and factory workers cool during demanding work and exposure to excessive heat. They are perfect for underground mining or workers required to wear encapsulated garments. When we get too hot or too thirsty, we all become irritable, frustrated, impatient and careless. We get in a hurry, our "clear- thinking" evaporates and accidents may happen. Personal Cooling Products Cool Vests are ideal in enhancing the well-being of workers in a wide range of applications from warehouses to construction, landscaping, roofing, roadwork, metal working, welding, paint shops, fire rescue and more. 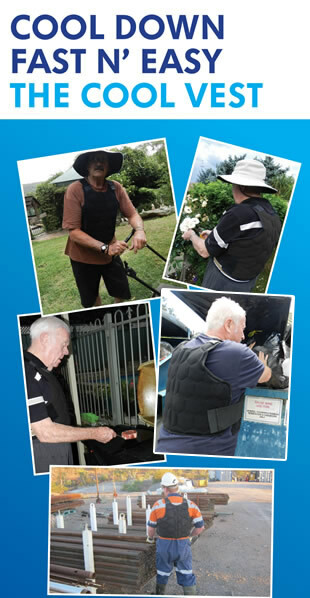 These same Personal Cool Vests can be used to provide heat relief while gardening, relaxing outdoors, playing sport, cycling or just about any other outdoor activity. 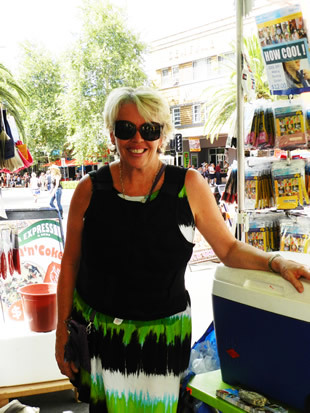 Personal Cooling Products Cool Vests have also been used to benefits for those with difficulty regulating their body temperature due to age or physical issues. These include older persons, children with conditions such as Ectodermal Dysplasia or Crisponi Syndrome, or people with Multiple Sclerosis. Our Cool Vest conforms to the body so well it is comfy even under motorcycle racing body suits. In fact, protective outerwear actually enhances the Cool Vest's effectiveness, by insulating the vests cool microclimate from the warm outside environment. How do I care for my Cool Vest ? Wipe it over and hang to dry. Your Personal Cooling Products Cool Vest is not affected by humidity. You will never have to worry about mould. With proper care your Cool Vest should last for many years. There is no limit to the number of times it can be used with no loss of efficacy. This product may be placed directly on the skin without fear of frostbite or soft tissue damage, although most people wear their Cool Vest over a singlet or a T-Shirt. The colour of the Personal Cooling Products Lightweight Endurance Cool Vest will always be black. Please note that your Hi Vis gear must be worn over the top to ensure personal visibility. The Cool Vest is not made of a material that is spark safe. If you are working/playing in a situation where there is the likelihood of sparks, please ensure you wear the Cool Vest underneath your protective clothing. This also makes the Cool Vest stay cleaner for longer as well. Small: In this model, the front is equal in width to the back. An elastic strap velcros from the back panel to the front panel as shown in the image. Horizontal width is 41cm across the torso of each panel, making it 82cm across both panels. This would be the tightest fit if the straps have pulled it totally together. However the elastic straps allow for an extra 15cm of expansion. This leaves the sides open for freedom of movement. Vertical length is 43cm from yoke below neck to bottom. Large: In this model, the front is a small panel while the back is an X-large panel. An elastic strap velcros from the back panel to the front panel as shown in the image. Horizontal width is 41cm across the torso of one panel and 50cm across the torso for the back panel, making it 91cm across both panels. This would be the tightest fit if the straps have pulled it totally together. However the elastic straps allow for an extra 15cm of expansion. This leaves the sides open for freedom of movement. Vertical length is 43cm from yoke below neck to bottom. X-Large: In this model, the front is equal in width to the back. An elastic strap velcros from the back panel to the front panel as shown in the image. Horizontal width is 50cm across the torso, making it 100cm across both panels. This would be the tightest fit if the straps have pulled it totally together. However the elastic straps allow for an extra 15cm of expansion. This leaves the sides open for freedom of movement. Vertical length is 43cm from yoke below neck to bottom. Sizing Tips: Remember to adjust the elastic straps on the vest so the vest is snug on the body. You have to think of the front and back of the vest as two separate pieces joined together by the elastic strap. The vest should sit high over your heart. If you drop your chin onto your chest, there should be a 3 finger space to the top of the vest if you are wearing it correctly.